Estancia is a gorgeous, family-friendly, gated community located in the heart of Boca Raton, FL that offers a diverse selection of elegant single-family luxury homes. Divided into three distinct subdivisions, Estancia, Estancia South, and Estancia West, this beautiful neighborhood is encompassed with natural pine trees, meticulously-manicured landscaping, and colorful tropical plantings. Known as one of the most friendly and welcoming gated neighborhoods in the area, 90% of Estancia residents call this highly-desirable community home year-round. Built in the late 1970's and early 80's, Estancia is comprised of 363 single-family homes that typically range from 1,500 to more than 5,000 square feet in size. Known for the wide variety of architectural styles and unique home designs, no two homes in this eclectic neighborhood are exactly alike. Estancia is also zoned for some of the area's top-rated public schools, including Del Prado Elementary School, Boca Raton Middle School, and Spanish River Community High School. Florida's Turnpike and I-95 are conveniently close to the community, offering quick and easy access to West Palm Beach, Miami, and Ft. Lauderdale. Whether you live in Estancia, Estancia South or Estancia West, you will find there the most serene and lovely neighborhoods that South Florida has to offer. 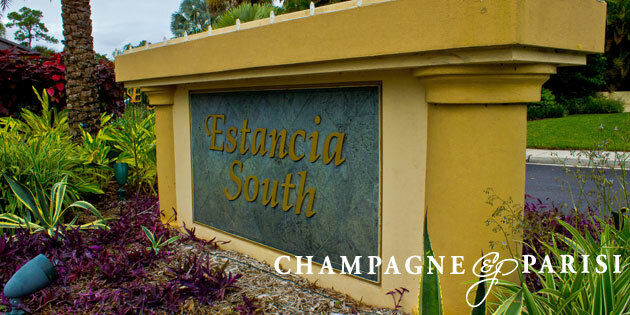 If Estancia sounds like the perfect community for your next home, you may want to visit similar Boca Raton gated communities such as Woodfield Hunt Club and Parkside, both of which offer a wide selection of elegant single-family homes within a secure, family-friendly community. If you would like to learn more about Estancia homes for sale, or if you would like additional information about other single-family home communities in Boca Raton, please call us at 561-998-9015. You may also reach us by completing the brief online contact form provided below and one of our residential real estate experts will reach out to assist you. We at Champagne & Parisi Real Estate are committed to providing unparalleled professional real estate services and personalize customer care for each of our clients. We are proud of the relationships that we build with our customers and hope that you will choose our dedicated team of Realtors to assist you in finding your next dream home in Boca Raton, FL!